CEO Sergio Marchionne wants the Giulia sedan to transform Alfa Romeo into a premium brand. That’s understandable as luxury cars are highly profitable. But he probably doesn’t have enough gas in the tank to take on Audi, BMW and Daimler. That can explain his recent merger zeal. 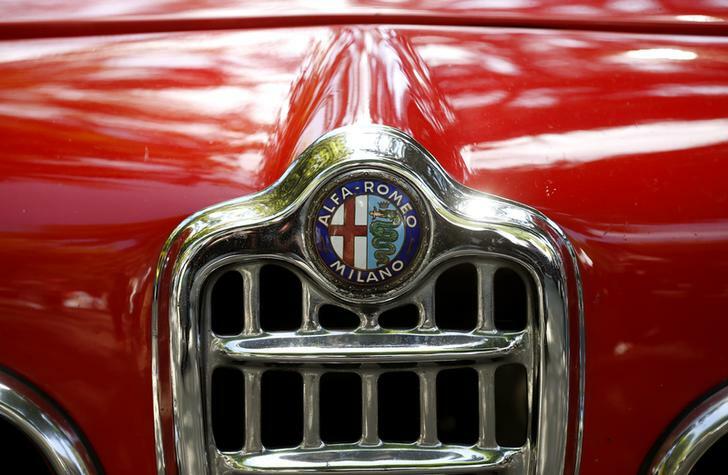 The logo of Italian manufacturer Alfa Romeo is seen at a 1964 Giulietta Sprint convertible car during a prologue of the Raid Suisse-Paris 2013 vintage car rally in Zurich August 21, 2013. Fiat Chrysler Automobiles unveiled the new Alfa Romeo Giulia, a midsize sedan, on June 24. It is targeted at drivers of BMW’s 3 series, the Mercedes-Benz C-Class and Audi’s A4. “This car can beat the Germans any day,” Chief Executive Sergio Marchionne said. Developed by a team led by engineers drafted from Fiat stable-mate Ferrari, the new Alfa Romeo will sit on a new rear-wheel platform, dubbed Giorgio, have around 500 horsepower and boast Ferrari-derived six-cylinder engines. Fiat plans to raise sales of the 105-year-old brand to 400,000 by 2018 by spending 5 billion euros ($5.6 billion) to launch eight new models, starting with the Giulia and followed by the launch of the next model within six months. Marchionne has repeatedly called for consolidation in the auto industry to share the prohibitive costs of building greener and more intelligent cars. He has already approached his counterpart at General Motors, Mary Barra, with a merger proposal but was rebuffed. However, sources have told Reuters that Marchionne was lobbying GM investors to drag the GM board to the negotiating table.